We are highlighting our 2 most popular heat packs, Sports Therapy Wrap and our Body Wrap for fast natural Back pain relief products, using our microwave heating pads to relieve lower back ache and muscle pain naturally with their warm moist penetrating heat. All heat packs can be used hot or cold depending on the therapy required. Buy Online here. The information below will help you select which is going to be applicable to you, they differ in size, weight and content. Which ever one you select will give you many years of fast back ache and stress relief. Here are a few of the other back pain ailments our heat packs can help relieve pain. Use hot or cold depending on therapy required. Back pain during early pregnancy. Why does heat help with pain? This process increases the flow of oxygen and nutrients to the muscles, helping to heal the damaged tissue. Heat stimulates the sensory receptors in the skin, which means that applying heat to the lower back will decrease transmissions of pain signals to the brain and partially relieve the discomfort. Sports Therapy Wrap: The heat wrap/heat pack used by therapists. This is a great gift for everybody. Extra large size, weight and penetrating moist heat provides comfort for those who suffer with back pain, lower back pain, muscle pain and shoulder pain. Infused with our signature anti-stress aromatherapy blend of lavender, peppermint, eucalyptus, rosemary and cloves. Comes with an adjustable belt to hold the wrap firmly in place. Extra long heat holding – 1 hour or longer. Contains our anti-stress blend. Use warm or cold to assist with the relief of aches, pains and stress. The perfect stress relieving gift. (10″ X 26″). The cover comes in black velvet with an embroidered Warm Buddy logo.Our most popular heat pack is used for fast natural backpain relief. The sports therapy wrap is the most effective heat therapy product that can maintain it's heat at the proper temperature. "Warm" is the proper temperature. Patients should not have their heat source be hot to the point of burning the skin. The desired effect is for the heat to penetrate down into the muscles. Simply increasing the temperature of the skin will do little to decrease discomfort. In many instances, the longer the heat is applied, the better.This where the sports therapy wrap will pay dividends with it's long lasting heat. The duration that one needs to apply the heat, though, is based on the type of and/or magnitude of the injury. For very minor back tension, short amounts of heat therapy may be sufficient (such as 15 to 20 minutes). For more intense injuries, longer sessions of heat may be more beneficial (such as 30 minutes to 2 hours, or more). Our Body wrap is also a time tested warrior against muscle pain and stress, slightly smaller (9" x 19") than the Sports Therapy wrap, but carries an equal pain relieving punch, it contains lavender which helps to relieve pain and stress, it also has a removable cover and an assortment of fabric covers. The Body Wrap can also be used hot or cold depending on what therapy is required. Using one of our heat packs will help you relieve lower back pain and muscle tension naturally. 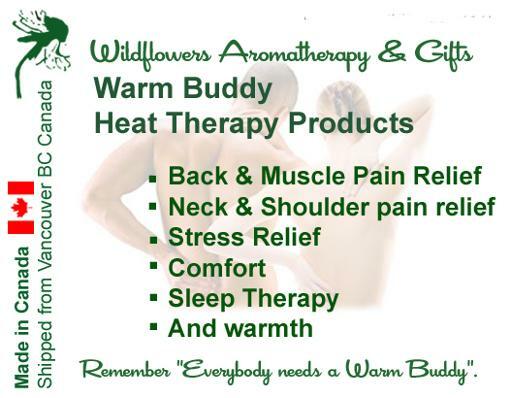 Visit our online store for a quick and easy way to Buy Online other Warm Buddy pain relief products.